[V-Letter from Karl Shapiro to George Barker, written in publication year of Shapiro's 'V-Letter and other Poems'.] A V-Mail [Victory Mail] letter (i.e. photographic print of autograph letter), praising Barker and criticising current 'War Poetry'. A V-Mail [Victory Mail] letter. San Francisco. February 1944. An interesting communication from one noted twentieth-century English-language poet to another, and of additional significance as a V-Letter written in the year of publication of Shapiro's first successful collection, the Pulitzer Prize winning 'V-Letter and Other Poems' (1944). (See Diederik Oostdijk, 'The Wartime Success of Karl Shapiro's V-Letter' (2006).) The present item is a V-Mail [Victory Mail] letter: a 13.5 x 11 cm photograph print of an autograph letter bearing the censor's stamp. [Collie Knox, the Daily Mail's 'star writer', bemoans his sacking from his £4000 a year job.] Typed Letter Signed ('Collie') with Autograph postscript, to Fleet Street editor Collin Brooks, discussing the circumstances of his dismissal. Whin Cottage, Beechy Leees, Otford, near Sevenoaks, Kent. (On cancelled letterhead of the Daily Mail, London.) 23 January 1941. See Knox's obituary, Times, 4 May 1977 (which refers to 'some passages at arms' he had at the BBC with Sir John Reith). 3pp., 4to. In good condition, lightly aged, with minor staining from paperclip. An interesting glimpse into the world of Fleet Street 'big salaries' during the war period. He begins: 'My dear Collin Brooks, | A letter such as yours, from a man such as yourself for whom I have so strong a personal, and professional, regard comes as a gleam of blue in a darkish sky.' He proceeds to bemoan his sacking by the Daily Mail: 'Yes, it is a bad business. [ J. Stelfox Gee, Manchester philatelist. ] Autograph Letter Signed ('J. Stelfox Gee') to 'Autolycus', regarding a document concerning 'the Manchester Mail Coach in 1805'. On letterhead of H. Verity & Sons Limited, 67 Mosley Street, Manchester. 19 May 1924. 1p., 4to. In fair condition, on lightly-aged paper. He is sending 'the two accounts or whatever you like to call them for the Manchester Mail Coach in 1805', but 'cannot make out exactly what they are beyond being a monthly return of the takings and division of profits of the running of the Machester to Derby Coach for August 1805'. [ Lord Harmsworth, press baron. ] 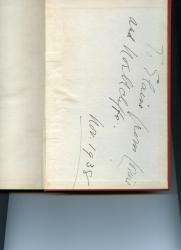 Autograph Note Signed ('Alfred Harmsworth') to 'Mr. Fisher', explaining that he cannot attend a meeting as he has to 'attend to my newspapers all day long'. On letterhead of the Daily Mail, Temple, E.C. [ London ] 29 November 1898. 1p., 12mo. In good condition, on lightly-aged paper. Reads: 'Dear Mr. Fisher | I am so sorry I cannot attend the meeting. Unfortunately, I am absolutely obliged to attend to my newspapers all day long. | Yours faithfully | Alfred Harmsworth'. The Daily Mail was little more than two years old at the time of this note. All four letters on letterheads of Church Headland, Whitchurch, Aylesbury. Three dating from 1974 and one from 1980. The four letters in good condition, on lightly-aged paper. Also present are carbons of four letters from Pitt to Household (three from 1974 and one from 1981). ONE: ALS. 11 April 1974. 2pp., 4to. He is delighted 'to be appreciated by a fellow craftsman' and is sending a copy of his 'Time to Kill', which he asks him to accept, as he has 'a number of them taking up useful shelf room'. TWO: TLS. 24 April 1974. 2pp., 4to. [ Victorian valentine Card. ] Hand-coloured engraved Victorian valentine card, depicting a young lady in shorts posting a letter, with the caption 'A valentine for my little friend'. On one side of a piece of 14 x 9 cm paper, with embossed design to the scalloped edges. Hand-coloured in yellow, pink, red, purple, grey and plum. A smiling young girl, blonde-haird and rosy cheeks, in gentleman's hat, muffler, plum velvet jacket, purple shorts and red tights, stands on the pavement, looking smiling at the viewer as she posts a letter with a red wax seal into a box marked 'Post Office' and 'London 12'. The caption at the foot reads: 'A VALENTINE | FOR MY LITTLE FRIEND'. [ John Rutherford Gordon, editor of the 'Sunday Express'. ] 'Rough draft' of typed article, with autograph emendations, on Lord Northcliffe, 'the incomparable journalist of the age', written from personal knowledge. 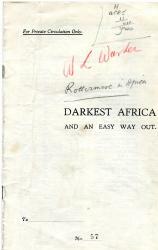 Dated 25 April 1952, and with autograph note stating that it was 'Partly used in Sunday Express [ London ] 27/4/52'. 21pp., fourteen of them in 4to, and the other seven pages cut down. In fair condition, on aged and worn paper. Stapled together, with the first leaf detached. The article is complete but untitled. It is unattributed, but comes from the J. R. Gordon papers. A well-written and incisive piece, written from an insider's point of view. Gordon lays out his stall at the very start: 'Few people of our generation have influenced the life of it so profoundly as Lord Northcliffe. He was the incomparable journalist of our age. Printed handbill timetable headed on one side '1837. Irish Mails. DOWN' and on the other side 'Western and Foreign Mails. - 1837. - Up and Down.' With contemporary manuscript note. 2pp., 8vo. On aged and worn paper. The side headed '1837. Irish Mails. DOWN' with timetable arranged in two columns, under headings: 'To Kingston via Holyhead', 'To Waterford (P) via Gloucester and Milford', and 'To Waterford (P) via Bristol and Pembroke'. Footnote reads: 'It may be curious to note that the present train mail service is under the liability of a penalty of £1 14s. for each minute it is after time through any avoidable cause.' The table on the other side arranged lengthwise on the page, with one section relating to the service from St.
[Edward Capern, 'the Postman Poet' and 'Devonshire Burns'.] Autograph Letter Signed to the poet William Kingston Sawyer, thanking him for a photograph and book of his verses ('Ten Miles from Town'). Rock Villa Harborne, Birmingham. 27 August 1869. 4pp., 12mo. Bifolium. In fair condition, on aged paper. Addressed to 'My Dr Sawyer'. He begins by thanking him for the photograph: 'Whenever I look on it - and I shall do so often - I shall be reminded of the fourth gentle poet who did all he could to make a few pleasant hours for a humble brother <?> during his short sojourn in the great metropolitan maze of this England of ours'. [Colonel Edward Corbett, Conservative Member of Parliament.] Autograph Letter Signed ('Edwd Corbett') [to his publisher Richard Bentley? ], discussing tables on mail coaches in his book 'An Old Coachman's Chatter'. With proofs of the tables. 'Longnor' [Longnor Hall, Shropshire]. 4 June 1890. The two items relate to the book 'An Old Coachman's Chatter with Some Practical Remarks on Driving. By a Semi-Professional. Edward Corbett, Colonel late Shropshire Militia. '(London: Richard Bentley and Son, 1890). Both the letter and the proofs are in good condition, on lightly-aged paper. LETTER: 3pp., 12mo. Bifolium. 34 lines of text in a particularly difficult hand. He will endeavour to 'throw all the light' he can on the subjects mentioned in his correspondent's letter, beginning:: 'I think the time between Cape Curig & Holyhead must be correct. [John Henry Batchelor, illustrator.] Autograph Letter Signed ('John H. Batchelor') to an unnamed recipient, discussing his work and terms. 15 St Johns Road, Boscombe, Bournemouth. [Thomas Hamilton, 9th Earl of Haddington, as Lord Binning.] Autograph Letter Signed ('Binning'), docketted 'Mail coaches', and discussing the 'measure of applying to the English counties', ' Mr Mundell' and the Glasgow Chamber of Commerce. 'Tynninghame [Tyninghame House, East Lothian, Scotland] | Sunday night' [docketted with date '16/18 Sepr 1810']. 3pp., 4to. On bifolium. In good condition, on lightly-aged paper, with slight damp-staining to one corner. '[...] The measure of applying to the English counties was proper & indeed necessary - and I doubt not that, as the evil complain'd of is very general, we shall find a very general & ready cooperation on their part in our endeavours to procure redress. Autograph Letter Signed ('R. H. Sherlock') from Randall Hopley Sherlock, editor of the Liverpool Mail, describing for his friend Mrs Roper the London International Exhibition of Industry and Art of 1862 at South Kensington. 4pp., 12mo. Bifolium with mourning border. In fair condition, on lightly aged and worn paper. He begins: 'My dear Mrs. Roper - | I have been rather long in fulfilling my promise to write - but I must lay all the blame on this most attractive International from which I can hardly tear myself away! My journey was a very pleasant one on Tuesday with agreeable fellow-passengers, there was another Bouquet besides mine in the carriage - but tell dear Annie it would bear no comparison with mine! Interleaved 'P.P.L.' copy, annotated for official use by 'T.K.S. ', of the Royal Mail 'Post Office Guide', with two years' corrections (1900-1902), abbreviations for various Post Offices, table of 'Post Towns' between 1900 and 1902, and other matter. 8vo volume, bound up and interleaved for official use. Internally sound and tight, on aged paper; in worn black leather quarter-binding with repair to loose boards. In gilt on spine is the title 'P. P. L.', with 'T. K. S.' at the foot, and these abbreviations are also present in pencil on the title page. The printed guide has a total of 282pp: title leaf + pp.7-24, 43-44, 47-258, 261-280, 357-374. It is interleaved from p.48 to the end with 128 leaves (256pp). Autograph Letter Signed ['G Shaw Lefevre'] from George John Shaw-Lefevre, later 1st Baron Eversley, to 'Mr Ellerby', regarding 'improvements in the service' of the Post Office. 7 June 1890; on letterhead of 18 Bryanston Square, London. 12mo, 3 pp. 30 lines. Text clear and complete. Good, on lightly-aged paper. His 'answer to Mr. King' is that 'under the present system the Post Office is completely under the control of the Treasury, and the Post Master General is little more than a clerk of the Treasury. The Treasury looks at the questions submitted to them from the point of view of the Exchequer and with a view to obtaining a continually growing revenue from the Post Office'. Suggestions for improvement of the service are 'continually & systematically refused'. [Miniature book, printed 'with the Smallest Type Ever Manufactured'.] A Sketch Of the Origin and Progress Of the Liverpool Collegiate Institution. Printed for the Institution during the Polytechnic Exhibition, By the Proprietors of the Liverpool Mail, with the Smallest Type Ever Manufactured, from the Foundry of Messrs. Miller and Richard of Edinburgh. 1843. The dimensions of the book are 4 x 5 cm. 48 pp. In brown card binding, yellow endpapers. Tight copy, in good condition on aged paper, in good binding with slight discoloration to endpapers. 'This Little Book, one of the least ever published, and certainly printed with the Smallest Type, is intended as a curious illustration of the extraordinary perfection to which the elegant art of Type Founding has been carried in modern days.' Filled with details concerning the Institution, including nine pages listing its officers and members. Printed pamphlet issued by the General Post Office, London, titled 'AIR MAIL', with table giving details of postal rates and services to various countries. Large 8vo (33 x 21 cm), 6 pp. Four-leaf pamphlet, with the final leaf blank. Clear and complete. Good, on lightly-aged and worn paper, with minor rust marks from removed staples. On the first page are twelve sections under the headings 'Letter Air Mails' and 'Parcel Air Mails'. The following four pages carry the table of 'Letter Air Mails', in columns with headings including Route, Air Fee, and Observations. The final page contains a table of 'Parcel Air Mails' and further observations. 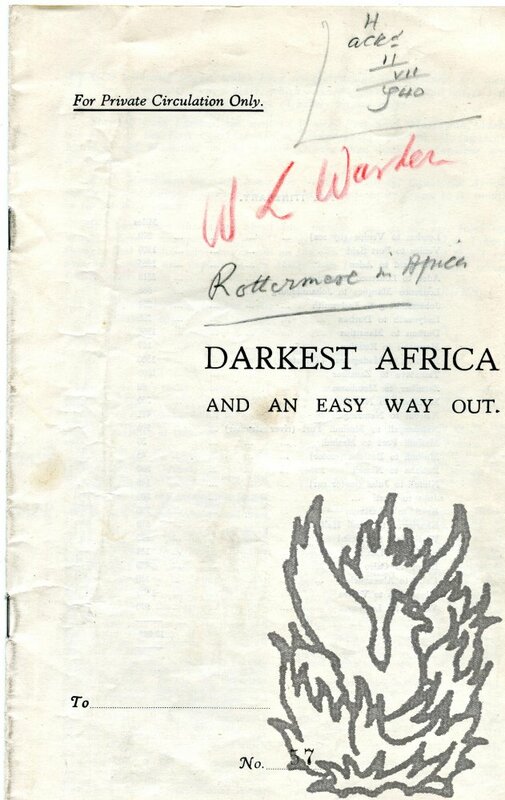 Darkest Africa And An Easy Way Out. 8vo: 12 pp (unpaginated). Wraps and stapled. Fair: on aged and lightly-creased paper. A few marks in pencil and red pencil (on two occasions 'my "Owner" ' in the text noted as 'Lord R.'). Stamped with limitation number 57. Printed in small type in double column. In his introductory note Warden explains that the text is 'made up of extracts from a diary, which I more or less kept, and letters sent home during a recent voyage of 20,000 miles. 8vo: 334 pp. Portrait of Northcliffe as frontispiece. Three facsimiles of letters in text and fold-out with facsimiles of three of Northcliffe's letters. Inscribed by Owen on front pastedown 'To Elaine from Louise and Northcliffe. | Nov. 1938'. (The reference to 'Northcliffe' is explained by the fact that Owen considered herself a spirit medium, in contact with the deceased Viscount.) Internally good: sound and tight, on lightly aged paper. In original worn red cloth, with slight bloom on front. 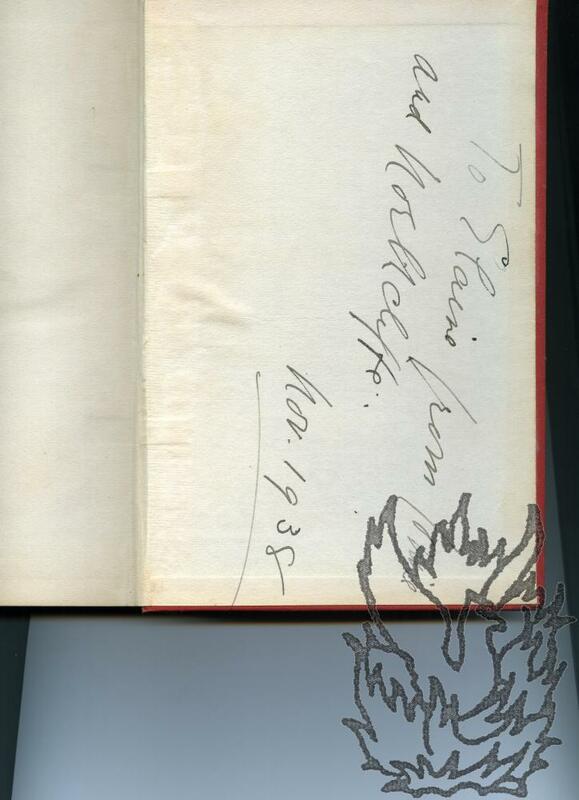 Autograph (Facsimile?) Letter Signed ('Jas. R. Fairfax') to male correspondent. 11 May 1884; on letterhead of the Sydney Morning Herald and Sydney Mail. 12mo: 1 p. Ten lines of text. Bifolium. Grubby, and with the text of the letter faint. Letterhead printed in red with illustration of the firm's headquarters. Written in, or faded to, lilac, and could well be a carbon. Sending copies of the two newspapers as 'we think it probable you would like your newly published works noticed or reviewed' in them. Signed ('J. 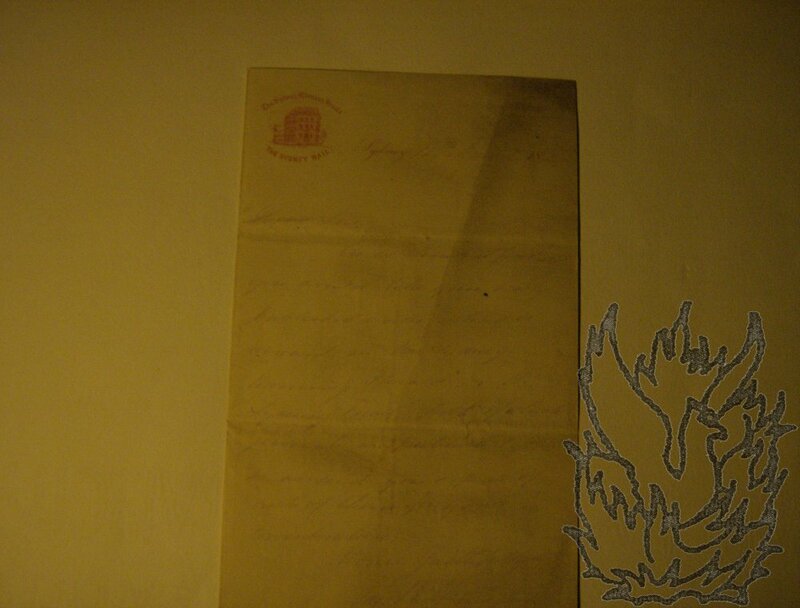 Henniker Heaton') Letter, in a secretarial hand, to A. M. Tapp. 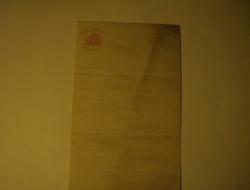 9 July 1891; on embossed House of Commons letterhead. 12mo: 3 pp. Good, but with the leaves of the bifolium separated, and reattached with three tissue mounts. 'It is impossible to trace the obstructiveness of the Postal department to any particular officials; they stand shoulder to shoulder, defiant and impenetrable, like a square of infantry'. Nevertheless Heaton has 'succeeded in getting some reforms of importance inserted in the Post Office Acts Amendment Bill'. Mentions 'permission to send circulars in unclosed envelopes' and briefly discusses the postage of newspapers to the Colonies. Handbill headed 'STOLEN POSTAL ORDER FORMS | STOLEN POSTAGE STAMPS NEGOTIATED BY MEANS OF STAMP SAVINGS SLIPS'. Two pages. On both sides of a piece of paper roughly twelve and a quarter inches by eight inches wide. Illustrated on both sides. An unusual piece of Post Office ephemera, and something of a period piece, on aged paper, with fraying to extremities. Begins 'The object of these instructions is to secure the apprehension of men and women who are negotiating stolen postal order forms and stolen penny stamps, the proceeds of thefts from Post Office. [...]'. Autograph Letter Signed to the Secretary, Royal Society of Arts. Editor (1857-1921) of the manuscript newspaper 'Congo Mirror', who 'drew attention to irregularities in Congo Free State, 1886; [...] and accused Congo officials of murders and atrocities; with help he carried on the agitation until the Congo Reform Association was formed; in a series of letters to the African Mail entitled the Lower Congo he pointed out the injustice of the French rule and the concessionnaire system in Congo Francais' (Who's Who). Three pages, 12mo. On grey paper. Very good. Docketed in pen and green pencil.